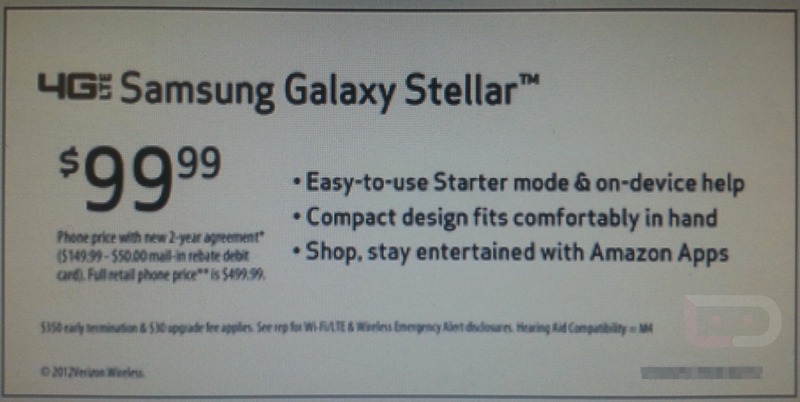 Galaxy Stellar Headed to Verizon With “Starter Mode” and Pre-loaded With Amazon Apps? The 4G LTE Samsung Galaxy Stellar, what are you? We saw you a few weeks ago on a rebate form, and assumed you were a low to mid-range Android device. The price of $99 in this image appears to confirm that notion, but what’s this “Starter mode” all about? And why are you being sold as a device that is preloaded with Amazon Apps rather than the Google Play store? Anyone willing to take a guess at any of this? Could this be one of the first Android devices made by a major manufacturer (in this case the Android manufacturer) to ditch the Google suite of apps and go with Amazon’s Appstore? An interesting move if true. I’ve got to admit, that the story of the Stellar has caught my interest, if nothing more than to find out how Amazon Apps are tied into the golden boy of Android phone making.